"Be swept away by the whimsical fun of The Jungle Book, accompanied by live music. Inspired by Rudyard Kipling's classic novel, Disney's 1967 animated masterpiece, The Jungle Book, is one of the world's most loved films. You can revisit its heart-warming story and memorable movie soundtrack in this UK premiere event, where the film is show in HD on a giant screen, accompanied by a live orchestra, choir and guest singers. 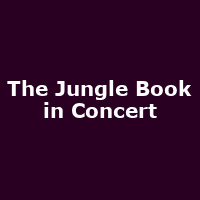 Disney in Concert: The Jungle Book is the ultimate symphonic cinema concert, featuring an iconic score by the Sherman brothers and unforgettable songs like 'Trust In Me', 'That's What Friends Are For (The Vulture Song)' and of course the showstopper, 'The Bare Necessities'."